Aoyagi in Kumamoto, Japan. Even bloggers need a holiday! In this and the next post we will share with you two very nice restaurants we experienced during our recent trip to Kyushu, Japan. Aoyagi is a restaurant in the heart of Kumamoto city. Located close to the covered shopping arcades in the shopping district, it is a restaurant that is highly sought after by locals and visitors alike. It was full house on the weekday when we had dinner there. Reservations should be made in advance to avoid disappointment. The centrepiece of the restaurant was the sushi bar area. Decorated in a very typical light-coloured scheme, the placed exuded a zen-like atmosphere. The menu was very comprehensive, with a range of set menus that catered to different budget levels as well as a range of a la carte choices. Thankfully, there was an English menu with some photos and the staff were very helpful. We decided to go with a combination of the familiar and the unknown. The familiar came in the form of a Kamameshi Aoyagi set course featuring a pot of specially flavoured rice together with familiar favourites like sashimi, tempura, chawan mushi and soup. The freshness and taste of the dishes were of a high level. The Kamameshi rice is a special variety of rice cooked in a small metal pot with an assortment of ingredients – meat, vegetables and mushrooms. It was wonderful. Better still, the price for the entire set was a reasonable 3,000 yen. Venturing beyond the usual we ordered some dishes of grilled fish and some local recommendations. We enjoyed all of them, but two needs special mention. The first is the tofu served with condiments and sauces. An extremely simple dish which looked very ordinary. But as an indication of the quality of ingredients and skill of the tofu maker, the taste of this humble dish was anything but ordinary. It was exquisite. The huge pile of tofu was despatched in quick time. The other highlight of the evening is a speciality of Kyushu in general – horsemeat which is widely available in restaurants in Kyushu. Horsemeat is prepared in a variety of ways, but the two usual ways are raw and grilled. We were too “chicken” to try raw horsemeat on this occasion (we eventually mustered enough to courage to try it at another meal later on) and ordered the grilled version. The grilling was done on your personal hotplate so you can dictate your own preference of ‘doneness’. Knowing we were novices, the chef kept a close eye on us and did most of the grilling. Sizzling with the oil from what seemed like a blob of animal fat, the thin slices of meat were cooked to a medium-well state in around three minutes. The taste? It tasted like a good cut of beef but with a bit more chewiness and a slight hint of gaminess. It would have been better with a nice glass of Bordeaux. but we made do with the sake. 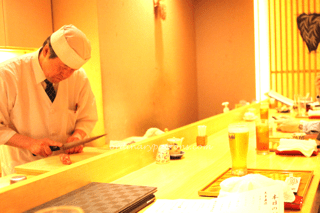 The entire meal for two with a good flow of Asahi super dry and sake came up to about 10,000 yen. Great food at a super price! Aoyagi is certainly a good enough reason alone to stop by Kumamoto if you happen to be in Kyushu. While you are here you might also visit the famous Kumamoto Castle so you an walk off the calories. The castle is around ten minutes from the restaurant by taxi.